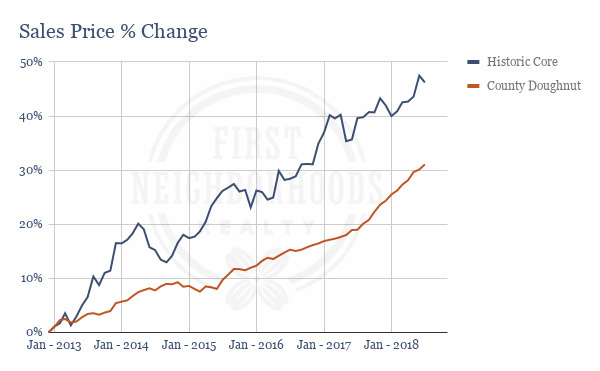 For our first look at Knoxville’s historic neighborhoods housing market I thought we would take a look back over the last 5 years to see how prices of homes sold in Knoxville’s historic core are changing compared to the homes further out from the city. Here are a few definitions and takeaways. Historic Core: Single family homes within a 4 mile radius of downtown Knoxville. County Doughnut: All single family homes that reside in Knox County outside of the City limits. Both areas have seen a sizeable gain in value over the last 5 years which is in line with national trends. The historic core has seen a roughly 15% greater increase in value during that time than the county doughnut. Prices increase for many reasons. While supply and demand play a large role one often overlooked driver of price increase is the improvement of homes through renovation. Every home is unique, and your own homes value will depend on many factors. If you are considering selling your home we would love to put our experience and knowledge of Knoxville’s historic neighborhoods to work for you! *Source data from Knoxville Area Association of Realtors MLS. Information is deemed reliable but not guaranteed. Trendlines will be a place for us to explore market data as it relates to Knoxville’s historic neighborhoods. Starting in the new year we will take a look at how home values, supply, and demand are changing in our historic neighborhoods and what that might mean for your home’s (or future home’s) value. Hold tight! We’ll be posting soon.